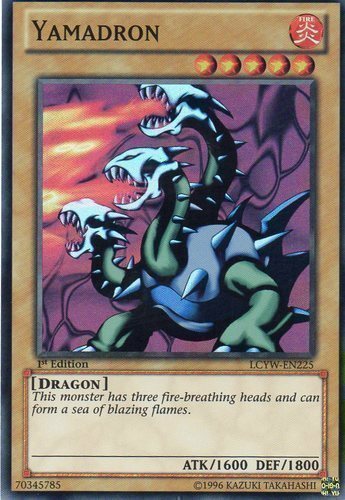 "Y-Dragon Head" + "Z-Metal Tank"
Must first be Special Summoned (from your Extra Deck) by banishing the above cards you control. (You do not use "Polymerization".) Cannot be Special Summoned from the Graveyard. You can discard 1 card, then target 1 face-down monster your opponent controls; destroy that target. When this card is changed from Attack Position to Defense Position, you can place any number of cards from your hand at the bottom of your Deck in any order you desire. 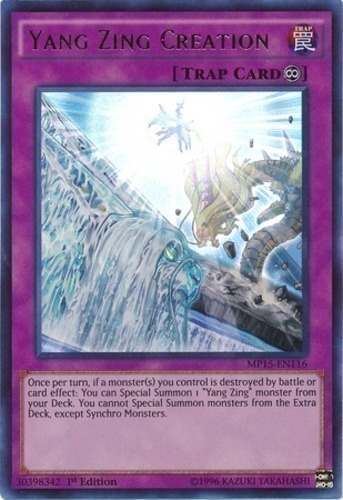 If this card is Normal or Special Summoned to a zone that is not the center Main Monster Zone, destroy this card. Once per turn: You can move this card to an unused adjacent Main Monster Zone. Each time exactly 1 monster is Normal or Special Summoned, to your opponent's field: Move this card to the adjacent Main Monster Zone closer to that opponent's monster, then destroy all other cards in this card's column. Cannot be Special Summoned. During the End Phase of the turn this card is Normal Summoned or flipped face-up: Return it to the hand. When this card is Normal Summoned or flipped face-up: You can target 1 Spell/Trap Card your opponent controls; return that target to the hand. This card cannot be Special Summoned. This card returns to its owner's hand during the End Phase of the turn it is Normal Summoned or flipped face-up. When this card inflicts Battle Damage to your opponent, draw cards until you have 5 cards in your hand. This card cannot be Normal Summoned or Set. This card cannot be Special Summoned except by removing from play 1 Spirit monster from your Graveyard. This card returns to its owner's hand during the End Phase of the turn it is Special Summoned. If this card destroys an opponent's monster by battle, you can destroy 1 Spell or Trap Card your opponent controls. If a "Yang Zing" monster you control battles an opponent's monster, during damage calculation: Your battling monster's ATK and DEF each become double its original ATK and DEF during that damage calculation only, but it is destroyed at the end of this Damage Step. Once per turn, if a monster(s) you control is destroyed by battle or card effect: You can Special Summon 1 "Yang Zing" monster from your Deck. You cannot Special Summon monsters from the Extra Deck, except Synchro Monsters. Target 3 "Yang Zing" monsters in your Graveyard; shuffle all 3 into the Deck, then draw 2 cards. You can only activate 1 "Yang Zing Path" per turn. This card gains these effects, based on the number of different Attributes the "Yang Zing" monsters in your Graveyard have. ● 2 or more: All "Yang Zing" monsters you control gain 500 ATK. ● 3 or more: If a "Yang Zing" monster(s) you control would be destroyed by battle or card effect, you can send this card to the Graveyard instead. ● 4 or more: Your opponent cannot Set monsters. Change all face-up monsters your opponent controls to Attack Position. ● 5 or more: You can send this card to the Graveyard; destroy all cards on the field. All monsters your opponent controls must attack, if able. During either player's Main Phase or Battle Phase: You can send this face-up card from your Spell & Trap Zone to the Graveyard; immediately after this effect resolves, Synchro Summon 1 Synchro Monster, using 1 or more "Yang Zing" monsters you control as Synchro Materials. A treasure box containing a monster that attacks any unwary bandit. You can discard 1 other "Mayakashi" monster; Special Summon this card from your hand. You can only use this effect of "Yasha, the Skeletal Mayakashi" once per turn. You cannot Special Summon monsters from the Extra Deck, except "Mayakashi" monsters. This card cannot be Special Summoned. This card returns to its owner's hand during the End Phase of the turn it is Normal Summoned or flipped face-up. When this card inflicts Battle Damage to your opponent, they skip their next Draw Phase. When a Beast-Type monster you control is destroyed by battle and sent to the Graveyard, you can remove from play 2 Beast-Type monsters from your Graveyard to Special Summon this card from your hand. Cannot be Special Summoned, except with the effect of a "Ninja" monster or "Ninjitsu Art" card. Once per turn (Quick Effect): You can send 1 "Ninja" monster and 1 "Ninjitsu Art" card from your hand and/or face-up field to the GY, then target up to 2 Spells/Traps on the field; destroy them. Cannot be used as a Fusion, Synchro, or Xyz Material for a Summon. While this card is face-up on the field, it cannot be Tributed. When this card on the field is destroyed: The controller targets 1 monster in their Graveyard; shuffle that target into the Deck. You can only control 1 face-up "Yellow Duston". When this card is Normal or Special Summoned: You can add 1 "Green Gadget" from your Deck to your hand. Increase the DEF of all monsters on your side of the field by 300 points. 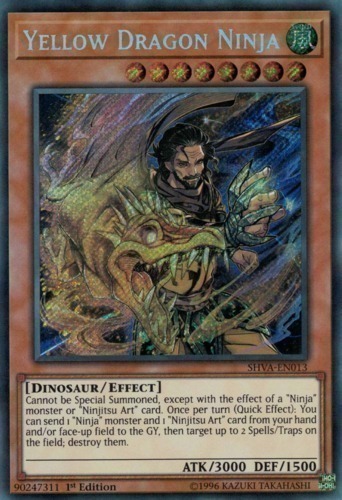 If this card is Normal Summoned or flipped face-up: You can Special Summon 1 Level 4 or lower "Ninja" monster from your hand in Attack Position or face-down Defense Position, also you cannot Special Summon monsters from the Extra Deck for the rest of this turn, except "Ninja" monsters. You can only use this effect of "Yellow Ninja" once per turn. When you Xyz Summon a monster: You can Special Summon this card from your hand. Once per turn: You can detach 1 Xyz Material from a monster you control, then target 1 face-up Xyz Monster on the field; reduce its Rank by 1, and if you do, it loses 300 ATK.